After their victory over Tampa Bay Sunday night, Bethlehem Steel secured their playoff spot. With New York Red Bulls II having taken all three points against the Riverhounds, the Steel have claimed sixth place and will travel to third-placed Pittsburgh. This is the Steel’s second consecutive season making the playoffs. Remember, this is only the third year that the Steel have been around. With 50 points, this is Bethlehem’s highest finish in the table in club history. How young? The Steel have six players 20-years-old or younger playing at least 500 minutes. 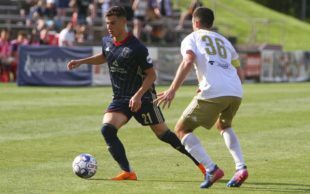 In the match against Indy Eleven on October 6, Bethlehem played a record-breaking youngest squad in club history with seven players under the age of 20. Given the Steel’s mission in developing and preparing players for the Union first team and given new Union Sporting Direcotr Ernst Tanner’s focus on the heavy use of players under the age of 21, Bethlehem has in a way already succeeded in the USL. Bethlehem Steel head coach Brendan Burke has found a good balance between experience and youth throughout this season. He’s been constantly adjusting the lineup. The Steel have had a different lineup 98 times in the club’s 100-game existence. It’s only taken Burke about two seasons to really build up and develop a quality team, with the squad improving every year. This season, we see that his balancing act has paid off for both Bethlehem and the Union, with both teams clinching playoff berths. Burke’s balancing act began with Derrick Jones, the first player signed to the Steel, right out of the Union Academy at age 18 in 2015. Looking to create and develop a strong, young team, 18-year-old Auston Trusty and 17-year-old Mark McKenzie were both called up from the Union Academy in 2016. Later in that season, both Jones and Trusty were signed to the first team as homegrown players. However, despite the great young players we recognize now, the Steel’s inaugural season was not great, finishing 11th in the East with only 28 points out of 30 games. It was the team’s first year, full of ups at first, and then a lot of downs towards the end. They did not qualify for the 2016 playoffs. Next season was a different story. More young players saw more time during matches in 2017 compared to 2016. Eleven Union Academy members were called up to the roster that season, including notable names such as McKenzie, and 17-year-olds Anthony Fontana and Brenden Aaronson. The Academy combined for 41 total appearances and 27 starts in Bethlehem’s regular season. As one of the youngest teams in the league, Bethlehem finished the 2017 regular season with 44 points (tied with Red Bulls II), and eighth in the East. In 2017, the Steel qualified for the playoffs for the first time in the club’s history. Finishing as the eighth seed, the Steel’s first round playoff match was away at conference winning Louisville City FC. Unfortunately, it was not an upset for Bethlehem, who lost in the conference quarterfinals. This year, Bethlehem have even younger players who have seen even more time in matches, and the team has finished higher than last season. Every year the Steel are improving, and given that they’ve only been around for three years, it’s a good time to be watching Bethlehem. Author: Sara Griswold Sara is a former midfielder who played for YMS in Bucks County and has terrible knees that gave up on her before college. Now, she watches soccer at home, which is on the other side of the river, and works in marketing. Follow her on Twitter @Sara_Gris3. Jim Curtin speaks to the media following the Union's 2-1 win over FC Dallas.